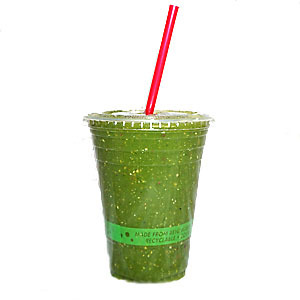 GreenFix Organic Smoothie contains a blend of organic greens so fresh they don't know they've been picked! 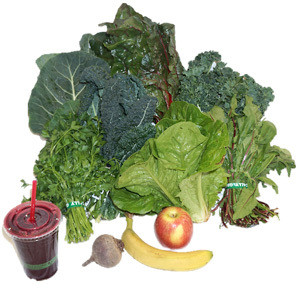 It is much like a fruit smoothie, only, in our case, it is all organic plant-based with greens, such as, chard, romaine lettuce, collard greens, kale, dandelion greens, parsley, and flax. The best thing is you are ensuring that you are consuming 100% Organic whole food and the most nutrient rich food you can get! The perfect balance of sweetness to make raw greens taste delicious! 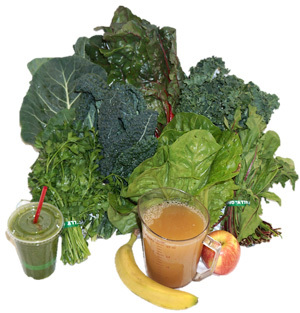 Organic Green Kale, Organic Lacinato Kale, Organic Collard Greens, Organic Swiss Chard, Organic Romaine Lettuce, Organic Dandelion Greens, Organic Parsley, Organic Apple, Organic Banana, Organic Pasteurized Apple Juice, Organic Flax Seed, Reverse Osmosis Purified Water. GreenFix Organic Smoothie: five blends one price. Our bottles are made of glass and BPA-free #2 plastic. Bring your washed bottle back for a refill at $10 for 32oz and $36 for Gallon. 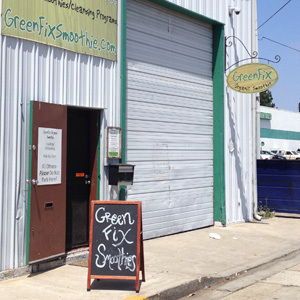 For GreenFix Raw we simply leave out the apple juice for a completely raw, whole-food, organic experience! 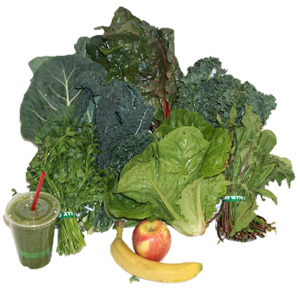 Organic Green Kale, Organic Lacinato Kale, Organic Collard Greens, Organic Swiss Chard, Organic Romaine Lettuce, Organic Dandelion Greens, Organic Parsley, Organic Apple, Organic Banana, Organic Flax Seed, Reverse Osmosis Purified Water. The Greens Only blend is just what it says! Nothing but the most nutrient rich foods on the planet! Organic Green Kale, Organic Lacinato Kale, Organic Dandelion Greens, Organic Parsley, Organic Flax Seed, Reverse Osmosis Purified Water. The Beet blend is GreenFix Raw with the addition of a whole organic beet! 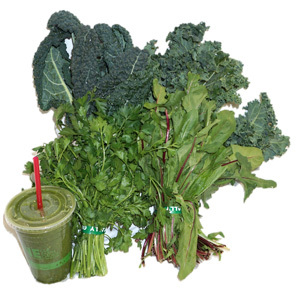 Organic Green Kale, Organic Lacinato Kale, Organic Collard Greens, Organic Swiss Chard, Organic Romaine Lettuce, Organic Dandelion Greens, Organic Parsley, Organic Beet, Organic Apple, Organic Banana, Organic Flax Seed, Reverse Osmosis Purified Water. The GreenFix Ginger & Mint blend is GreenFix Raw with the addition of a whole organic ginger root and mint leaves! 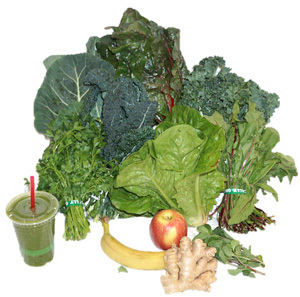 Organic Green Kale, Organic Lacinato Kale, Organic Collard Greens, Organic Swiss Chard, Organic Romaine Lettuce, Organic Dandelion Greens, Organic Parsley, Organic Mint, Organic Ginger Root, Organic Apple, Organic Banana, Organic Flax Seed, Reverse Osmosis Purified Water. Follow us on Facebook for menu updates, specials, events, and any farmer's market changes. Check us out on Yelp as well!